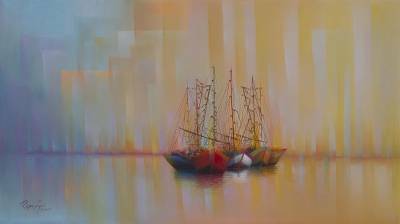 Signed Realist Maritime Painting from Peru, "Paradise in Altamar"
Teodoro Reque Liza offers this charming and enigmatic scene, inspired by the boats of Peru's northern coast. Painting in a realist style, Tedodoro depicts a group of boats huddled together on the altamar, or "high seas." In the background, hues of yellow and blue are blurred together as rays of light climb towards the sky, creating a dreamlike aesthetic.